June was an exciting time for Woodlore, with our first ever Woodlore Emergency First Aider course taking place. 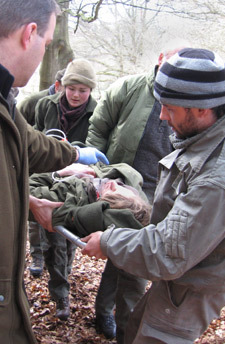 It’s the first in a new range of Woodlore First Aid courses, providing a solid introduction to the application of First Aid in the outdoors. For more information on this or any of our other courses, please get in touch. This entry was posted in Bushcraft Courses & Expeditions on June 29, 2010 by Woodlore Team. One thing that I’ve always wished Woodlore would offer is a first aid kit tailored for the wilderness. Just a base kit would do in a well designed outdoor friendly case, so that we can add items and tailor it more specifically to our needs. There is only one company offering FAKs aimed specifically at the outdoor market and is not bushcraft oriented.